I am not a huge fan of Lady Gaga but I love her songs particularly “Born This Way” and “Bad Romance”. But, my friend and I drove 12 hours back and forth just to see Lady Gaga’s very controversial Manila concert and I was not disappointed. At the end of the concert, I felt a good amount of amazement and respect to a woman who is indeed a Lady at some points but definitely gaga all over. Our General Admissions ticket of 2,100 pesos was all worth it, the show is something I’ve never seen (since I really love watching concerts). In addition, 600 pesos for toll fees, 3,100 pesos for gasoline and 600 pesos for snacks and dinner. Its really all just worth it. I’m not sure she’d come back anyway, after saying that she will be shot if she pursue her Jakarta concert, I just hope not! Photo above shows our view from the top. The surround sound at the Eye Arena is not fit for the faint of heart. The sound reverberates throughout the arena you can literally feel the vibration to your face. 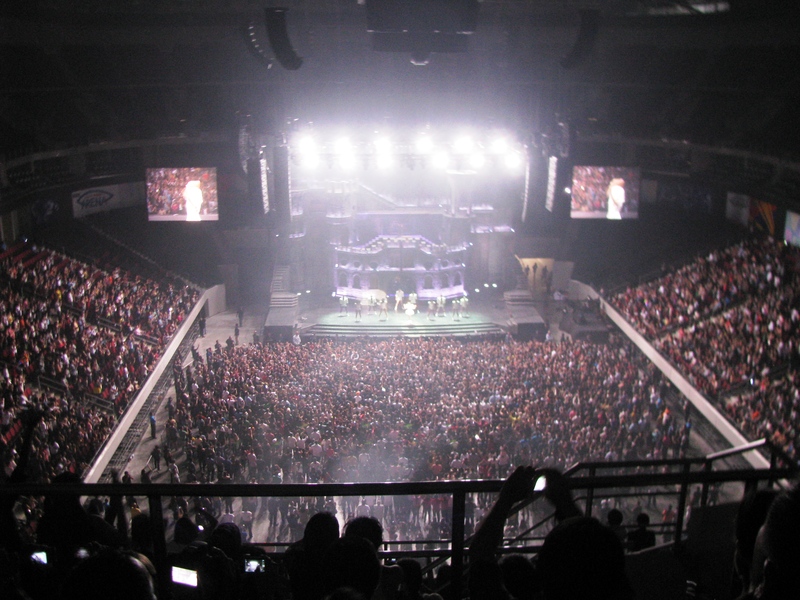 Gaga’s music is famous among teens and young adults in the Philippines, its not surprising to see the audience sing-along (like Filipinos do) and dance to the tune of every single one of Gaga’s music. Each performance is heart-stopping, the stage moves about, it closes and it opens. The costumes not just of Gaga but all of her backup dancers were a feast to the eyes! The stage, the production number, lighting and sounds effects were well-thought, no wonder the front row seats are a staggering 15 thousand pesos per head ($340) ! We watched the concert on the 2nd day and wow, the arena was still jam-packed, all tickets sold out despite the controversies and the attempt by the local city government of Manila to ban her arrival and threatens to put her in jail should her show be found malicious. I think it even added to the people’s curiosity about her. Some people accused Lady Gaga of being ‘satanic’ as she promotes homosexuality and liberal about gay marriage in addition, her latest song ‘worshiped’ Judas and blasphemed Jesus. I think one has to scrutinize her music before throwing some serious name-calling and worthless bashing ! After seeing her perform, I went beyond admiring Lady Gaga, yes, she swore a lot during her performance, but one has to go beyond that ‘artistry’ in her. If you can’t stand her, do not listen to her music at all. But her music is a product of her long-time dream, its a dream that became a reality. Five years ago, nobody knew who she was, until she became what she is today. And from her words I quote, “I am sure that I spread more inspiration and positivity than all of my critics has ever had”. Yes, a few years in her career and she has been an advocate to human equality regardless of race, gender and skin color. Her reach is global and her platform is big, it can be seen and heard the world over. I guess some just have to stop hating and respect people’s individual views. Take them for what and who they are and the cause that they represent. Otherwise go and mind your own business. I never thought how much a very good singer Lady Gaga is, her voice was like over the top, she can belt it all out like there’s no tomorrow while dancing ! She is a true talent who is true to herself unmindful of what other people thinks. Lady Gaga was a nobody a few years back and she is now considered as one of the biggest superstars in the world. She is living her dreams and we should just let her be. Lady Gaga’s endearing moment with her back-up dancers. The two on the left were celebrating their birthdays and Lady Gaga. had to ask the audience to sing for her dancers a Happy Birthday song and exclaimed how much she loves them (dancers). A true talent indeed sir:)she has a lot of haters and yet has a lot of fans who loves her:3 how i wish i was there too! Hoho! She’s and amazing performer and artist. It’s great you got to see her live, sir. What an experience it must’ve been! it was a treat watching her perform. she’s unique and totally out of this world but very entertaining. Indeed it was :-)) she is really something Leslie ! Lady gaga is indeed a good singer..and i was touched by the last part of the blog when she sang a birthday song for her dancers.not just a good singer but a good friend too. That’s so true :-)) she’s a true artist!